Hand-colouring black-and-white photographs with watercolour or other transparent paints is a process that has a long history in New Zealand, and, before the advent of affordable colour film, was the primary means of representing colour in a photographic image. Undoubtedly the best-known examples of this craft came from the firm of Whites Aviation, whose idealised landscape views were popular in postwar New Zealand for their depiction of a pristine, unspoiled and uninhabited country, rendered in hyper-real blues and greens. In contrast, Bridget Reweti’s series Aspiring of the North deploys this technique to create images that have a ghostly, liminal quality. The photographs themselves are a series of views of Zermatt, Switzerland, shot in half-frame on 35mm film. This means that each print consists of two images side-by-side, each occupying half of the intended exposure area of the film. It is important to unpack the technical specifics of these works because these formats and processes function as part of a broader network of meanings and associations. By using a half-frame camera, Reweti draws the viewer’s attention to the idea of duality or pairing, a concept that resonates throughout the series. To begin with, this series comments on the colonial impulse to refigure the colonised territory as an analogue of that which is already familiar. Reweti’s title inverts the colloquial description of Tititea/Mt Aspiring as the ‘Matterhorn of the South’, instead making the Swiss mountain subordinate to its Antipodean ‘twin’—the Aspiring of the North. Visiting Switzerland, Reweti places herself in the position of a tourist, reversing the historical relationship between Europe and the Southern Hemisphere as observer/observed. Her images of the Matterhorn comment on the way photographs of landscapes were a kind of currency that stood in for first-hand experience of natural wonders like the Pink and White Terraces in 19th century New Zealand, transforming places into images that could be stored or transported back to England. This idea of the photograph as a reflection or reproduction is also a kind of pairing, setting up a duality between reality and simulacrum. By hand-colouring her images, Reweti makes explicit the intermediary role played by the photographer, calling into question the photograph’s status as a representation of reality. However, unlike the fantasy-tinged Edenic views produced by Whites Aviation, Reweti’s imagining of these landscapes is not romanticised; rather, they are bleak, atmospheric and strangely ethereal. The dual nature of these works, in which two similar but unique images are paired, invokes the idea of stereoscopy, a process whereby two photographs taken from slightly different angles are viewed by the left and right eyes simultaneously, to create the illusion of a three-dimensional image (as seen in the classic Viewmaster toy). 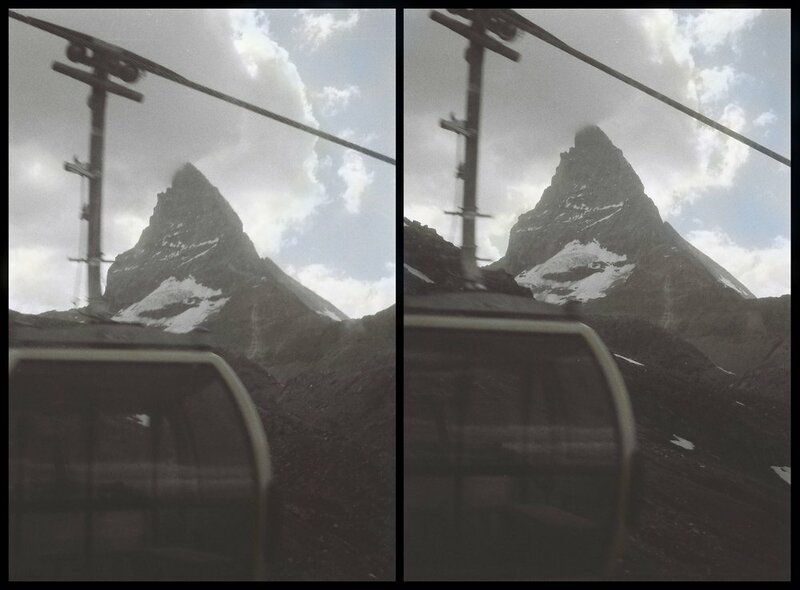 Reweti’s paired images are much further removed from one another than those in a traditional stereoscopic view, again perhaps commenting on the literal and metaphorical distance between Tititea and the Matterhorn, despite their purported resemblance. In Town (2019), the titular buildings in the foreground blend together into a pool of inky shadow from which the Matterhorn emerges in stereo, bathed in an unearthly light. In Crane and Gondola (both 2019), elevated views of the mountainous terrain tempt the viewer with their scenic beauty, but also represent the area’s use as a ski-field, recontextualising the landscape as a resource being exploited, rather than an inaccessible object of admiration. Reweti’s use of watercolour is subtle and restrained, avoiding bright or saturated colour in favour of subdued tints that fade into and blend with the grey tones of the photograph itself. The transparency of the watercolour creates faint halos of colour, lending objects a hazy, indefinite quality; the landscape becomes utterly immobile, as though locked in time, but also ephemeral and translucent. This is a sophisticated series of works that rewards close and thoughtful viewing. Although these photographs were taken in Switzerland, they are indisputably about New Zealand, and about the role that representations of the landscape have played in shaping our conception of ourselves. Also on display at the Pah Homestead are some of Reweti's more recent works from a series still in development, which she created as part of the Wild Creations residency program, supported by the Department of Conservation and Creative New Zealand. These works expand on the themes found in the Zermatt photographs, but are a departure in terms of scale and format, being large, digital colour prints. 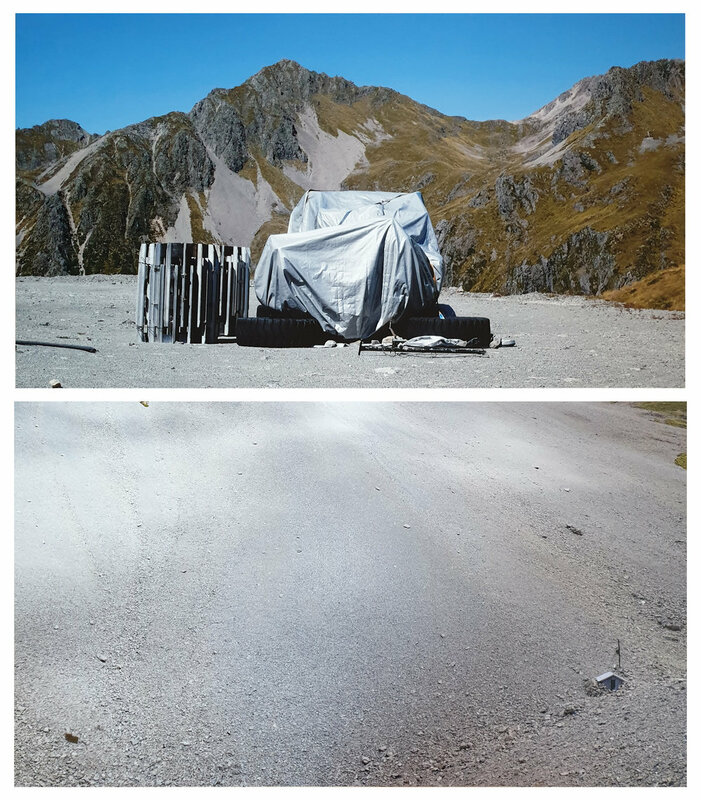 These images depict New Zealand ski fields during the summer months, perhaps offering a commentary on the way these locations are reconfigured and imagined as recreational spaces, by presenting them snow-less and abandoned. Andrew Clark is a writer and editor based in Auckland. He has a background in fine arts and a PhD in English. His areas of interest include New Zealand art, photography, literature, film and science fiction.